Shop 3" Round Side Step , 4" Oval Side Steps , 5" Oval Side Steps , 6" Oval Side Steps , Drop Down Steps , Running Boards , Wheel To Wheel Tubes , Powered Running Boards , and back to Side Step Bars / Running Boards or exterior accessories. 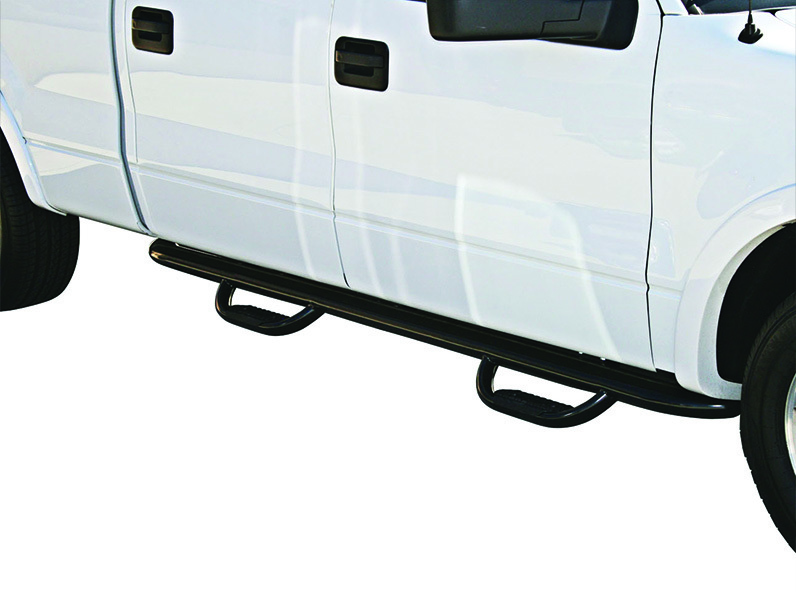 Looking to install a step that can provide easy access to your vehicle and truck bed? A drop down step could be the addition you need. Drop down steps fit tightly along the bottom of the vehicle, with hoop steps that are positioned along the entire length in order to provide that boost up you need when entering or accessing the bed of your truck. We offer the best in quality brand names like TrailFX and Westin, and you can select from polished stainless steel, black, or textured black finishes to suit your vehicle. These steps are manufactured from stainless steel or black powder coated steel tubing that are weather-resistant so the steps can hold up against the tough Canadian climate. They’re also easy to install with mounting brackets that are customized to your pick-up truck. These drop down steps are customized to fit a wide range of makes and models, such as the Chevrolet Silverado, GMC Sierra, Colorado and Canyon, Dodge RAM, and Ford F-150 and F250-F550 Super Duty, Toyota Tacoma and Tundra, and also Jeep Wrangler JK, just to name a few. No matter which brand you choose, you’re guaranteed to have that convenient, reliable and sleek looking step that you’re in need of. And when you order from AutoEQ.ca, you can enjoy exceptional prices and fast delivery through our warehouses that are located throughout Canada. Did we mention we offer every day free shipping on all orders? Hop over to our list of inventory to browse all of our Drop Down Steps and anything else your truck or SUV needs.